EDGE&TA BRANCH SAFETY OFFICERS, EDGE&TA SAFETY OFFICERS, AND EDGE&TA INSURANCE ADVISORS ARE AUTHORIZED TO SHUT DOWN ANYONE FOR UNSAFE OPERATION. EVERY participant in EDGE&TA events MUST be a member of an EDGE&TA Branch. No set of requirements, regulations or cautions can prevent an incident. We must, however, take these safety requirements seriously. Our individual awareness and adherence to both required and desired requirements will greatly increase the safety of our parade entrants and the public who attend our sanctioned events. 1. A driver must be at least 16 years of age or older and have a valid drivers license. A driver between the ages of sixteen and eighteen must have written permission from their parent or guardian in the form of a Sharecropper’s Parent/Guardian Permission Form signed and dated for this show. 2. If you are a member age 12 through 15, and do not have a valid driver’s license, you must have completed the EDGE&TA Youth Driver Training Program and have a Youth Driver Training Certification Card on your possession to drive in a parade or on the show grounds. 3. There shall be only ONE (1) person on a tractor when moving, unless there are provisions for others and these provisions meet with the Safety Officer’s approval. 4. All tractors must have an Emergency kill switch or device accessible by the operator. 5. A working fire extinguisher must be located in proximity to any operating equipment. 6. Riders on Ford tractors and others that are side mounted in front of the rear wheels may not have riders unless seat is specifically designed and submitted for approval. 7. NO riders shall stand on the drawbar or hitches. 8. Tractors with cabs may have riders if they are on the inside and the doors are closed. 9. All PTO shafts shall be covered when possible, or disengaged. 10. A slow operating speed shall be maintained, usually 3-5 mph. 11. 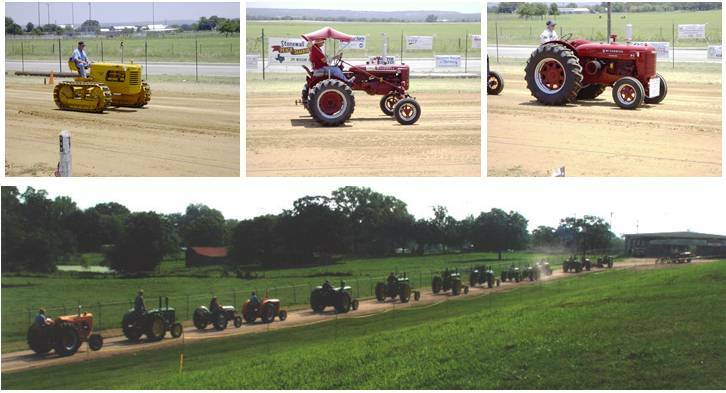 When operating a tractor in a parade, always drive parallel to the spectators. 12. When operating a tractor in a parade, never throw candy or other objects from the tractor/wagon/people mover. 13. Towing tractors must have adequate brakes to handle the towed load on any incline that may be encountered. 14. Never leave a tractor in gear when parked. This prevents a tractor from lunging when started and possibly injuring bystanders or damaging other equipment. 15. Never leave an unattended tractor running. 16. All pulled wagons or people movers shall have a washer and hitch cross pin in the bottom end of the pulling pin, grade 8 bolt with double nuts, or conventional ball hitch. 17. Draw bar on pulling vehicle must be of adequate length for turning radius of wagon/mover being pulled to prevent ride-up on pulling vehicle wheels. 18. Parade officials will determine the placement of tractors. 19. No alcohol is to be served or consumed. 20. A Parade Official/Safety Officer may shut down any operation at any time due to unsafe operation or conditions.